Most of the 11 million Sylheti people live in the north-east of Bangladesh, in the Sylhet district. Some can be found just across the border in India and many have moved to Arab or Western countries. 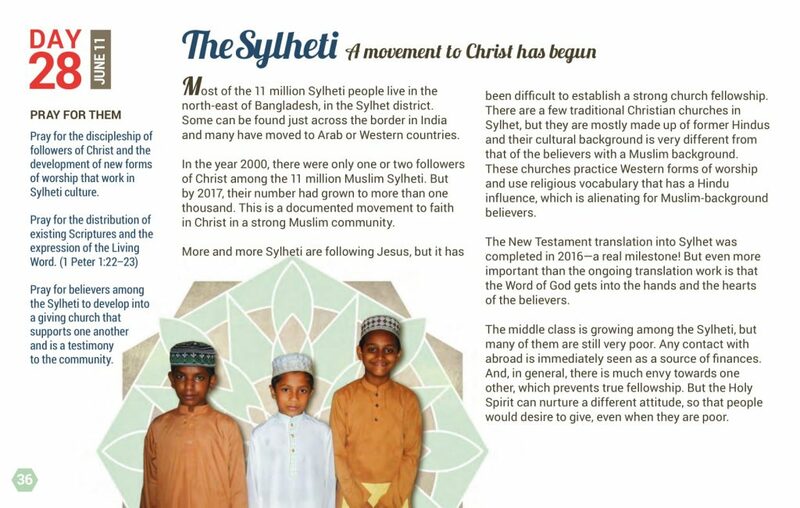 In the year 2000, there were only one or two followers of Christ among the 11 million Muslim Sylheti. But by 2017, their number had grown to more than one thousand. This is a documented movement to faith in Christ in a strong Muslim community. More and more Sylheti are following Jesus, but it has been difficult to establish a strong church fellowship. 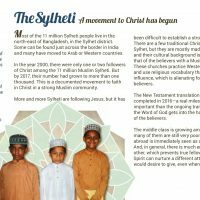 There are a few traditional Christian churches in Sylhet, but they are mostly made up of former Hindus and their cultural background is very different from that of the believers with a Muslim background. These churches practice Western forms of worship and use religious vocabulary that has a Hindu influence, which is alienating for Muslim-background believers. The New Testament translation into Sylhet was completed in 2016—a real milestone! But even more important than the ongoing translation work is that the Word of God gets into the hands and the hearts of the believers. The middle class is growing among the Sylheti, but many of them are still very poor. Any contact with abroad is immediately seen as a source of finances. And, in general, there is much envy towards one other, which prevents true fellowship. But the Holy Spirit can nurture a different attitude, so that people would desire to give, even when they are poor. Pray for the discipleship of followers of Christ and the development of new forms of worship that work in Sylheti culture. Pray for believers among the Sylheti to develop into a giving church that supports one another and is a testimony to the community. These pages are made available every day during the 30 Days of Prayer for the Muslim World for those who cannot afford to purchase, or do not have access to the booklet.